From using and understanding nonverbal communication to initiating an interaction with peers, social skills can be extremely challenging for children with autism spectrum disorders (ASD). In fact, since social skills challenges are one of the defining diagnostic criteria of ASD, they are a core area of focus for many therapists, parents, and teachers. Fortunately, there are many fun activities that help children learn to interact socially. Children on the spectrum tend to focus on one learning style, rather than two or more like kids without autism. 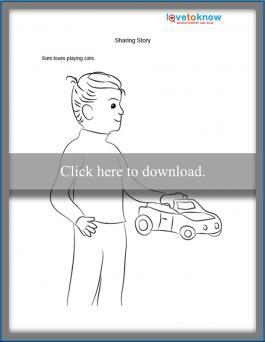 For visual learners with ASD, printable activities can be most effective in teaching social skills because the use of images plays to the child's strengths. Try one of these five fun printables to see if it becomes a new favorite. If you need help downloading a printable, check out these helpful tips. Sharing toys and materials involves taking turns, reading nonverbal cues, communicating verbally, and having empathy. Each of these independent skills is difficult for a child with autism, so it's no surprise that an activity involving them all would be challenging for these kids. A social story is a great way to explain the intricacies of sharing toys before your child is faced with an actual sharing experience. This activity combines a story about sharing with fun coloring pages for children to enjoy and provides an auditory and kinesthetic lesson. It is ideal for verbal and non-verbal preschoolers and young elementary kids. Click on the image of the printable and download it to your computer. Print out the desired number of copies. Create a small book out of the pages to the story. Read through the story with kids, talking about how each character feels. After reading, give kids crayons so they can color the pictures. 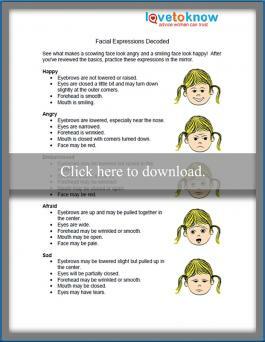 Print the facial expression decoding activity. Non-verbal communication, especially facial expressions, can be a challenge for children with autism because they spend less time than others scanning someone else's face during interactions. Instead of focusing on the facial expression as a whole, it may be easier for kids to systematize the parts of the face that make the expression. In addition, practicing their own facial expressions can help them communicate effectively with peers. This activity works well for verbal or non-verbal kids of any age. Print out as many copies as you need. Hand the copies out to kids. For those who can't yet read, have a paraprofessional or aide work directly with the child. Give each child a small mirror. Work together to practice reading and mimicking the various facial expressions. Print the conversation starter cards. Initiating a conversation can be tricky, especially for children with autism. These kids may have trouble communicating in social situations because they aren't equipped with conversation strategies like opening lines, miss nonverbal cues to engage, and have trouble with empathy among other reasons. 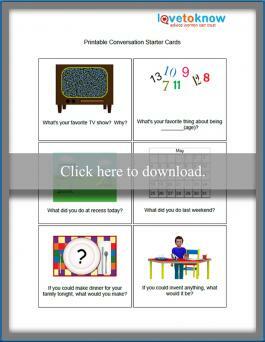 These printable conversation starter cards make a great in-class or at-home activity because they provide children with opening lines to start a conversation. Kids can practice with teachers and parents to perfect their skills. This activity is best for verbal, older elementary and middle school kids. Click on the image of the conversation cards and download the file to your computer. Print the desired number of copies. Cut out the cards and punch a hole through the corner. Tie them together with a piece of yarn. For extra durability, consider laminating the cards. Have the child select a card to use and ask you the question on it. Respond as a peer might. Pair children up to practice the conversations on the cards. 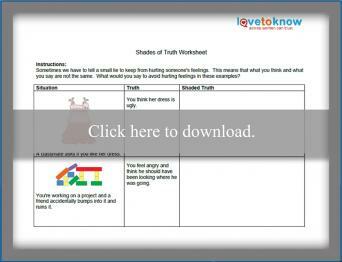 Print the shades of truth worksheet. Children with autism often think in absolutes, and this can be a social challenge when it comes to truth-telling. Researcher and author, Brittany Thompson, shares how walking through social scenarios before experiencing real-world instances helps kids with ASD feel prepared. This worksheet helps kids understand situations where telling the complete truth may not be appropriate so they'll better understand the concept of honesty in more concrete terms. This activity requires reading, so it's best for verbal or non-verbal children in later elementary school or middle school. Click on the worksheet and download it to your computer. Pass the worksheet out to kids. You can discuss each situation as you go through the worksheet together. Keeping the conversation on topic can be especially challenging for children with ASD because they have limited interests and the ability to focus only on those interests or get completely distracted by other stimuli says the American Speech-Language-Hearing Association. The goal in this game is to encourage turn-taking in a conversation that must only be about the given topic. It's best for elementary school or older and requires kids to be verbal. Print the desired number of copies. You'll need one for each pair of kids. Cut out the red and green tokens. Pair the children into groups of two. The goal for each group is to have an on-topic conversation. You provide the topic. Kids take turns in conversation about the provided topic. Each time a child says something that's on topic, he or she receives a green light token. Each time a child says something that's off topic, he or she gets a red light. 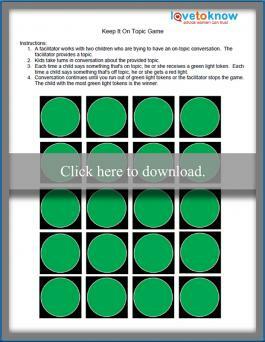 Conversation continues until you run out of green light tokens or the decide to stop the game. The child with the most green light tokens is the winner. Whether you're a teacher focusing on social skills or a parent trying to help your child succeed, there are lots of fun activities that can help at any age. Autism Educates suggests making sure you have your child's full attention before staring activities by removing distracting sights, sounds, and scents from the area then using touch to get his attention and incorporating movement into games and crafts. Gather up several instruments and give one to each child. Explain you'll be creating music together but not everyone can play at once. Instruct children to wait for you to point at them before they start playing. Tell them to stop playing when you point and shake your head. Sit in a circle with the kids and practice the pointing and head-shaking cues in addition to the music. Brainstorm simple social situations and emotions. Write these ideas on slips of paper. Put all the papers in a bucket. Have each child draw a piece of paper out of the bucket and act out what it says. The rest of the group can guess. Describe a problem scenario to the child or group of kids. It's best to choose something they may encounter in daily life. Have kids brainstorm ways to respond. Write down all ideas and don't engage in discussion until everyone has had a chance to share. Discuss which of the ideas are most likely to help. Have kids vote on how they would finish the story. Purchase standard, blank mailing labels and cut into smaller pieces or write with a marker directly onto Lego bricks or any other type of building block. Write words related to things that are important for a friendship, such as kindness, understanding, fun, care, and teamwork, on the longest blocks. Write words associated with bad relationships like teasing, name-calling, bad words, hitting, and stealing on the smallest blocks. Have the teen build a sturdy structure using the bricks they think describe a good friendship. Talk about why their structure is or is not the strongest it can be and, if needed, demonstrate how to build a strong friendship by literally building a pyramid shape out of the long bricks. Demonstrate how flimsy a structure loaded with the tiny bricks can be. Choose a daily task like making breakfast, getting dressed, or making the bed. Ask your child to follow a few steps behind you and mimic each move you make. Proceed to complete the task using a series of simple steps. For example, with making breakfast you might say out loud, "I'd like to have cereal today." Then get out a bowl, spoon, cereal, and milk. Next, pour the cereal and milk in the bowl and put each ingredient away. Now you can take your bowl and spoon to the table. Ask your child to name each step she mimicked. Have her complete the task and you mimic her movements. Sit down together and eat the cereal and talk about any differences between your steps. Choose one part of your teen's schedule to focus on in the activity. One easy example is leaving the house in the morning to head to school or work. Grab a piece of paper and a pencil and have your teen brainstorm all the steps involved in this task. Have your teen go through the list and number the steps in the correct order. Write each step on a standard piece of copy paper, then lay all the papers on the floor in a random pattern about two feet apart in any direction. Ask your child to walk directly from one "paper step" to the next in the correct order without touching an incorrect paper. No matter which activity you choose, working directly on social skills is a great way to improve a child's quality of life. Like everyone, children with autism want to interact with others. Having the right tools and enough practice can go a long way toward social success.